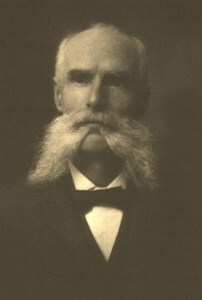 Charles W. Platts emigrated with wife to the United States in 1864. He was an expert knife maker from Sheffield, England, learning his trade as an apprentice at the age of fourteen in 1852. 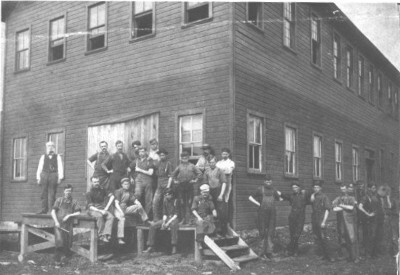 Settling in Connecticut, Platts engaged in the cutlery business shortly after their arrival and stayed there until 1893 when they moved to Little Valley, NY, to join their son Harvey, already working for Cattaraugus Cutlery since 1891. 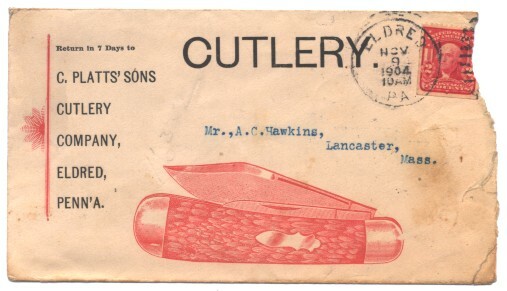 By 1896, Charles and his five sons organized C. Platts & Sons Cutlery Company in Gowanda, NY. Charles was general manager. His eldest son Charlie, headed the materials room; Harvey was in charge of the grinding and finishing; Joe, Ray and Frank supervised the cutlers and assembly. 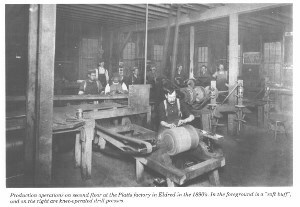 Extremely successful with their business and high quality, Platts and sons were looking for larger quarters for their operations. In 1897, their cutlery was lured to Eldred with a larger building, which was to be deeded to them within five years, and a cash bonus. Platts would operate their business in Eldred for the next eight years. 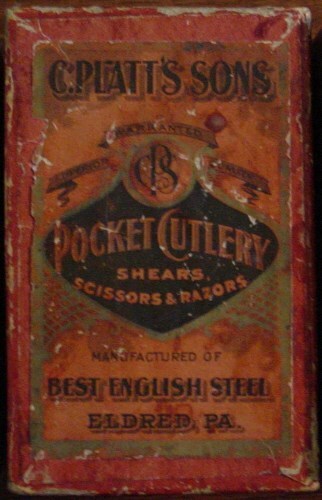 The cutlery offered a full range of products including pocket knives, shears, scissors, razors, butcher knives, paring knives, shoe knives, razor strops and hones. 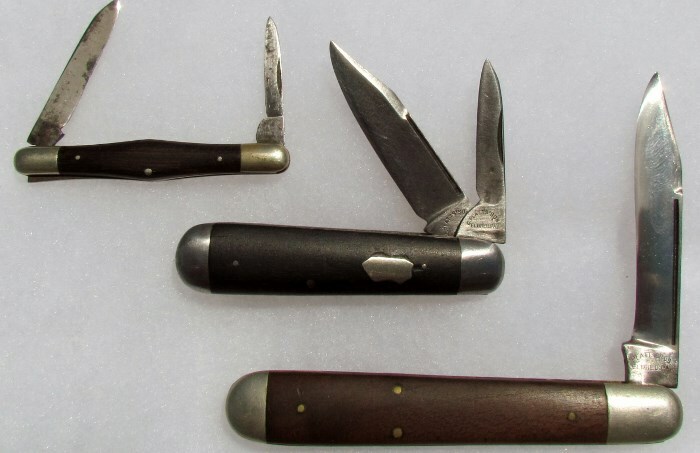 Platts used the trade name “Keen Edge.” They were also contract manufacturers for private brand pocket knives that carried the customer’s own brand names rather than that of Platts. 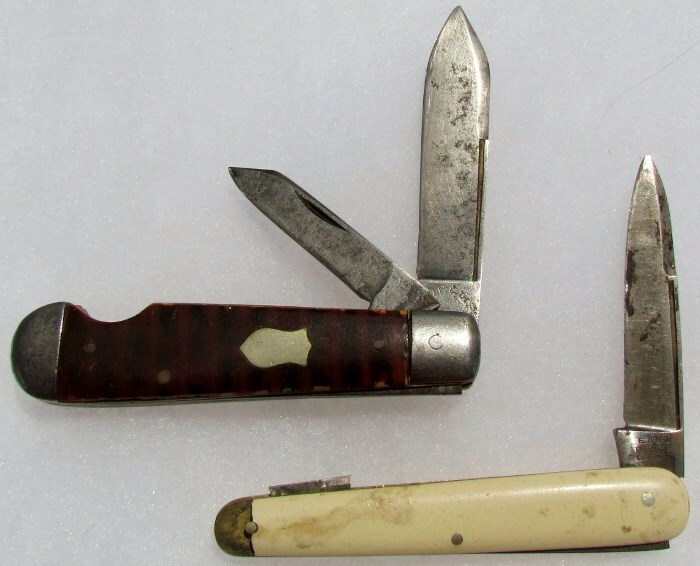 The Case brand was one such knife made by Platts. The cutlery employed some forty hands and was shipping nearly sixty orders weekly. 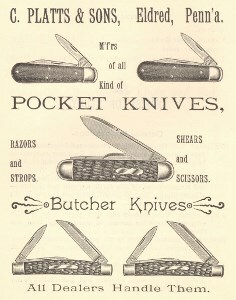 Platts maintained the highest quality of their knives and kept an excellent reputation in the United States as the best cutlery available at that time. In 1900, Charles W. Platts suffered a severe stroke and never recovered, dying later that year. He was buried near the old family homestead in Northfield, Connecticut. His wife Sarah also moved back to Connecticut and their sons stayed in Eldred. 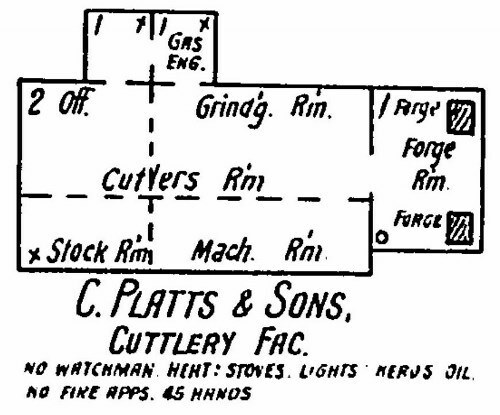 After the death of their father, the sons named the company C. Platts’ Sons Cutlery Company. Harvey rose to the leadership of the company and did most of the sales travelling across Pennsylvania, New York, Ohio, Nebraska, Indiana and Kansas. Work was hard and long hours were common in the cutlery business. It wasn’t uncommon to work ten to twelve hours, six days a week to meet customer demands. Work related accidents and the ’grinders consumption’ also took their toll on employees. 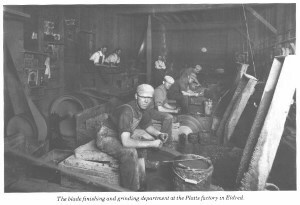 The grinders consumption or silicosis was caused by years of breathing the cloud of sandstone dust in the grinders room. Harvey Platts would suffer this very ailment and move from Bradford to Colorado and start another family cutlery operation there in 1911. In 1903, C. Platts’ Sons incorporated with $35,000 in capital stock. Harvey Platts had married Debbie Case in 1892, and maintained a very close connection to her family at Case Brothers Cutlery Company, still located in Little Valley, NY. Russ Case and Harvey Platts often travelled together on sales calls. They both thought about merging the two firms to keep ahead of continuing competition, not just between their own companies, but as well as outside competition. The remaining Platts brothers did not want either to undertake heavy debt or to admit an outside investor into their family business. They offered to sell their shares of the factory to Harvey, if he decided to go ahead with the merger. The price was substantial for Harvey Platts because the stock was from a well-established manufacturing business. 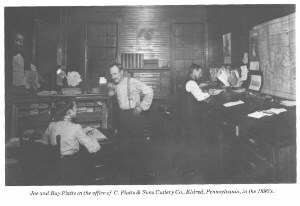 In January 1905, Russ Case and Harvey Platts incorporated their new business and established the W. R. Case & Sons Cutlery Company, newly located in a large three story brick building on Bank Street in Bradford, PA. The news to Eldred townspeople was shocking to say the least. 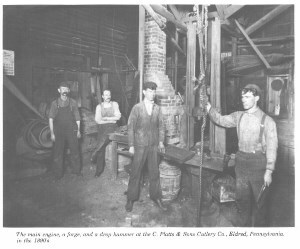 Platts were a well respected part of the community and had pumped $125,000 in wages to the town during their tenure. In February 1905, it was announced that the equipment of Platts would hauled to Bradford for the new operation. Several experienced employees joined the ranks of the new Case facility also. Eldred businessmen and remaining cutlery employees sought to keep a cutlery company in Eldred. They acquired Harvey’s older brother Charlie Platts to set up production for the new cutlery. 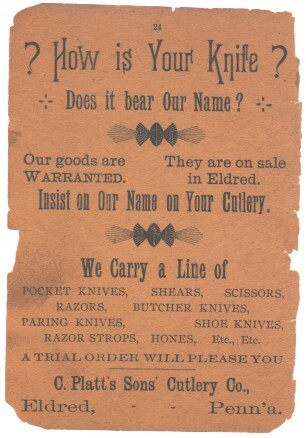 On March 1, 1905, the building rights had been secured from Case and the new cutlery was to be named Eldred Cutlery Company. C. Platt’s Sons Cutlery ceased production in Eldred on June 16, 1905. 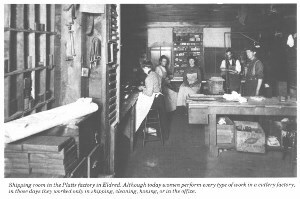 By the end of June 1905, all the new equipment was in place for the newly formed Eldred Cutlery Company. Ray Platts helped with the operations for a few months before moving back to Connecticut to work for another cutlery firm. Charlie Platt left the Eldred Cutlery in October 1905 and started a cutlery jobbing business with his other brother Frank on Elm Street. This was called Platts’ Brothers, Eldred, PA. 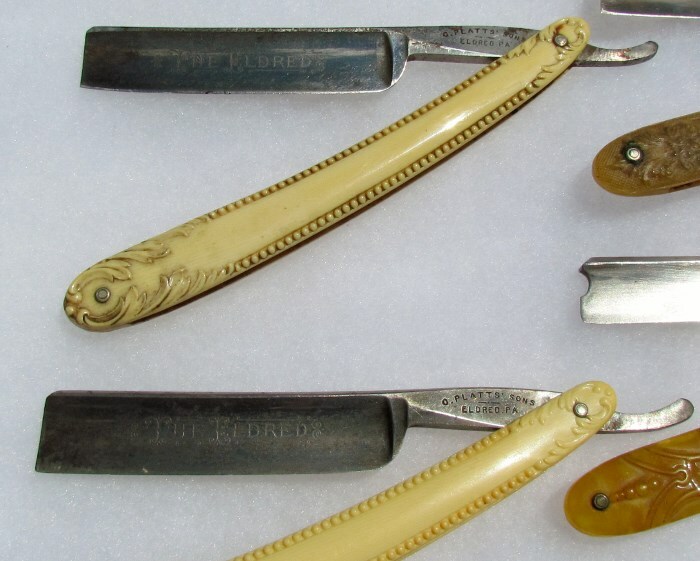 In 1906, the grinders and finishers of Eldred Cutlery joined the national union. An order for 2,000 pocket knives was received. In 1907, a general exodus of employees to other cutleries left the company with half their staff. 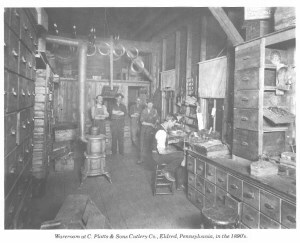 Charles and Frank Platts also left Eldred in 1907 and founded Platts Brothers in Andover, NY, with their brother Joe Platts. A financial depression in 1907 had its toll on the cutlery in Eldred. Continuing to struggle in 1908, Eldred Cutlery was unable to gain enough business to rid their debt burden from the previous year. A sheriff’s sale was called against the cutlery and three Eldred businessmen purchased the company. The Brown-Rice-Hennigan Cutlery Company was formed and closed its doors in 1909, unable to sustain enough orders to stay in operation. On September 29, 1909, the Brown-Rice-Hennigan Cutlery Company machinery was sold to the Union Knife Company of Union, NY. The sum of $7,500 was paid for everything but the building and gas engine power supply. 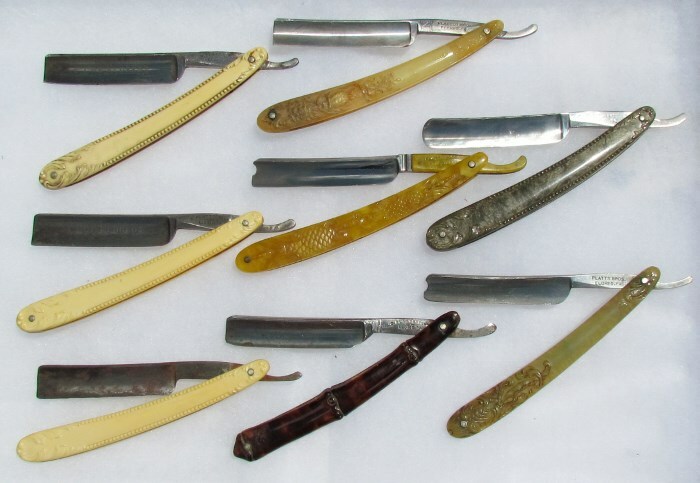 Charles Platts organized the stock campaign to raise $25,000 from the Union, NY, citizens to create the cutlery. The cutlery building was used by the Eldred Dairy Products Company in 1924. In 1925, the building was used automobile sales and service, as well as a machine shop. Tuttle and Walker moved their machine shop business from Rixford to this location in 1925. Donald Walker took over the machine shop from his father in 1965. 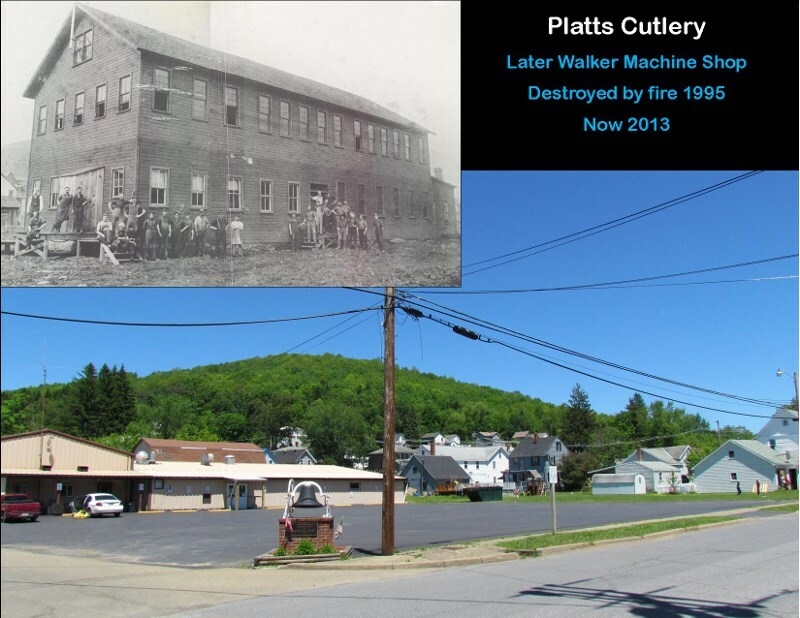 Walker’s Machine Shop would remove the second floor of the massive building just prior to July 1995, when fire destroyed the former historic Platt’s Cutlery building. Today the former site is a parking lot for the adjacent Eldred Fire Department and Platt Street is named in honor of the former cutlery.